Stanford’s goal for this page is to provide you with an informative and entertaining source of news about Stanford University School of Medicine. They hope you enjoy the page enough to post on our wall from time to time. They particularly welcome additional information on the subject of our wall posts, opinions that advance a debate on the subject of our posts, factual correctio…ns, and your posts about events at the school. 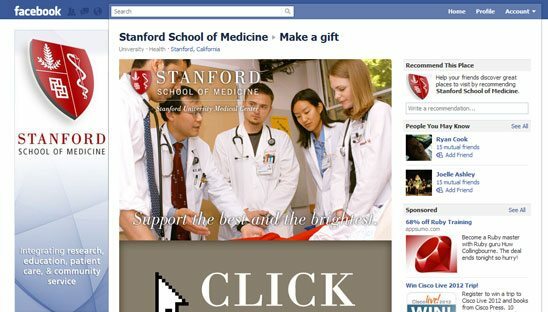 The main focus for this custom facebook tab is to drive traffic to the “Support and give a gift” page on Stanford Medical’s website. We created a cool CSS photo slide show in the top section and the bottom is a huge cool link that hovers red.